Use the Make Targets view to select the make targets you want to build in your workspace. The table below lists the toolbar options displayed in the Make Targets view. 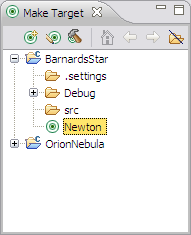 New Make Target Opens the Create Make Target dialog box to define a new make target. Edit Make Target Edits currently selected target in the Modify Make Target dialog box. Build Make Target Builds currently selected target. Home Move to the top level. Back Navigates back to a previous level. Forward Navigates forward to the next level. Hide Empty Folders Toggles the display of empty folders in the Make Targets view.